decided to see where the current state of the blog system was since the last time I looked at it about 3 weeks ago, and found that it broke strict xhtml 1.1 compliance in a ton of places. 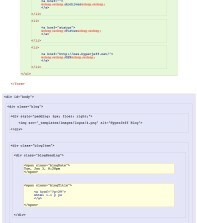 So, I cleaned up the place and learned a bit more about all that garbage (css, xhtml, the safari placeholder tag, etc). It all seems legit right now. I read somewhere that the <br /> tag is going to deprecated, and I still make use of that, but I'll burn that bridge when I come to it.